When I was young, I had aspirations of being a lawyer. 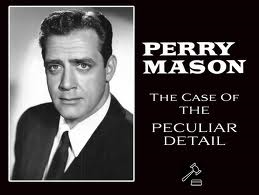 This was, of course, based on my perception of lawyers on television, and mainly Perry Mason at that. For whatever reason (the grace of God?) my life took a different direction. The law is a noble profession. All of us need lawyers from time to time. It’s good to have a guide in matters of property, wills, and other issues that are both important and complex when one enjoys the rule of law. In my Polish neighborhood, the lawyers offices were labeled “Adwokat” – or advocate. I like that. Unfortunately, somewhere as a society we got in the habit of resolving all our problems by confrontation. Punching the other guy; drive by shootings; road rage. At least we don’t carry grudges for 300 years and plant IEDs – but I digress. Does this mean that the cream of the legal profession is focused on the survival of the stupid and the greedy? This entry was posted in Actor, Business, Celebrity, Culture, People, Philosophy and tagged attorney, Law, lawyer. Bookmark the permalink.